We are all very excited to hear that the Sumpter Valley Railroad’s “Christmas Train” will be coming through Sumpter this year. 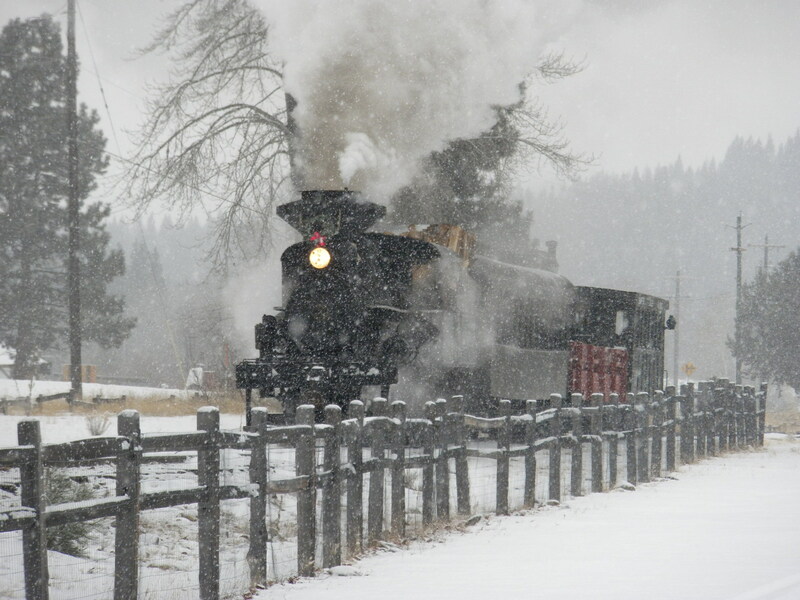 Joining the City of Sumpter’s annual Christmas Celebrations, the train will be making several runs on Saturday, December the 8th and Sunday, December the 9th. With hot cocoa, snowy scenery (weather permitting), and all of the festivities in town this is a great way to start the holiday season! So, keep your fingers crossed for snow and come join us! Don’t worry! The updates will NOT affect viewing the blog. 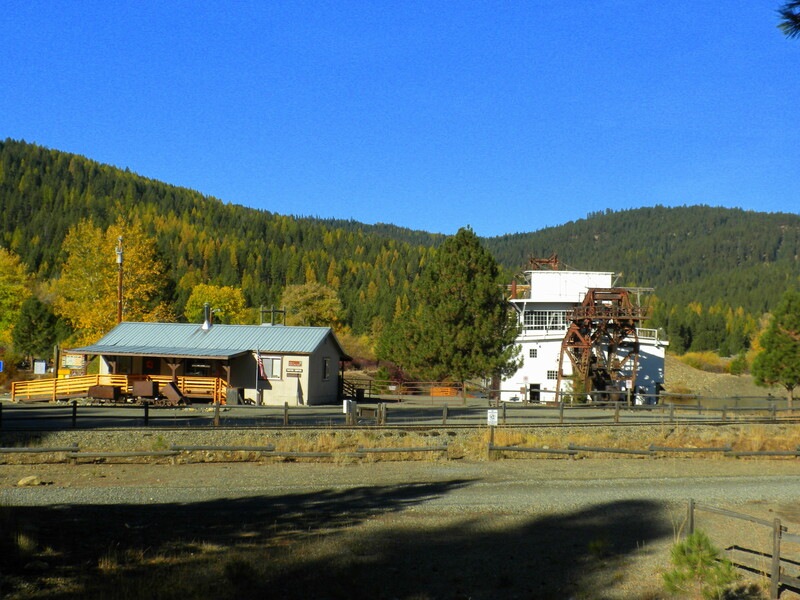 The Sumpter Valley Dredge Blog is in the process of updating it’s “Pages”. You might notice that several of the links at the top of the blog have changed. Our pages have now been set up in “drop-down” menu form to consolidate our links and make room for new goodies. Simply select the menu-link itself or hover over the menu-link to see the “drop down” links. The first of these new pages to be rolled out is “Winter 2012-13“. This page has two sub pages for you to use to access updates on snow-levels, snow-shoeing updates, and other important winter updates. 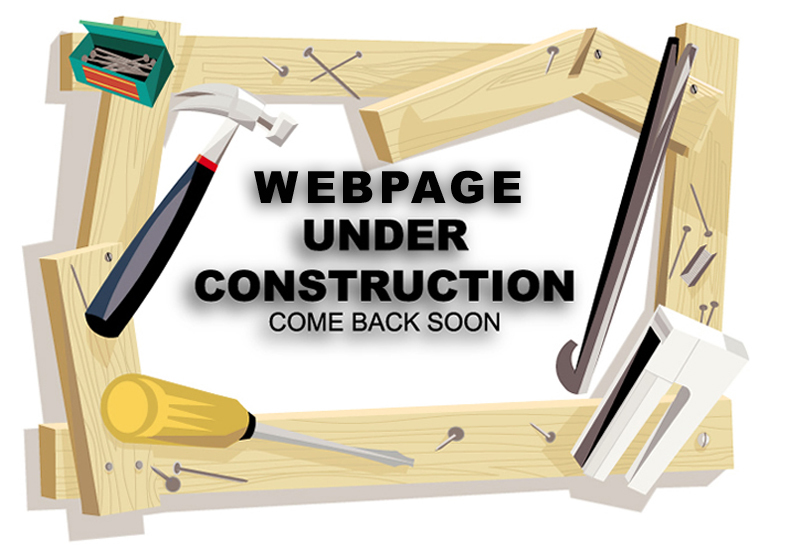 The changes and updates will not affect viewing the blog. All entries and current pages will still be accessible. We’ll keep posting updates when we add the other new pages. Last week the park closed up for the season. With the docks pulled off the dredge, the interpretive store closed, and the interpretive panels put away the park definitely looks like it’s ready to hibernate. And of course there’s the gate. A gate definitely seems to say “Do Not Enter.”. But looks can be deceiving. Occasionally, at the sound of car tires making a U-turn on pavement, one might see the head of a Park Ranger popping out of the shop or from around the trees. If the vehicle doesn’t move away too quickly, the ranger might have time to catch up to them. Why? 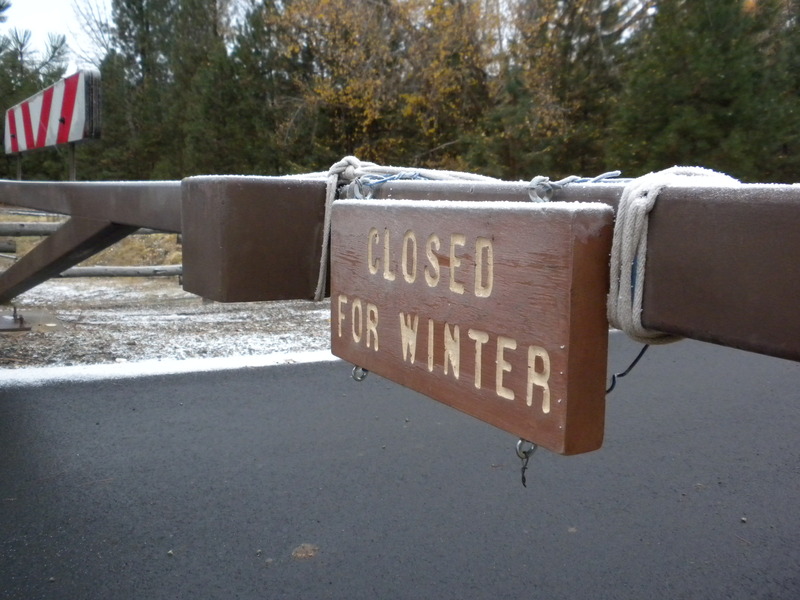 While we are required to close the gate in the off season it doesn’t mean the park is off limits to visitors. If you happen to be stopping by there are places to park in the alley to the right just before you reach the gate. 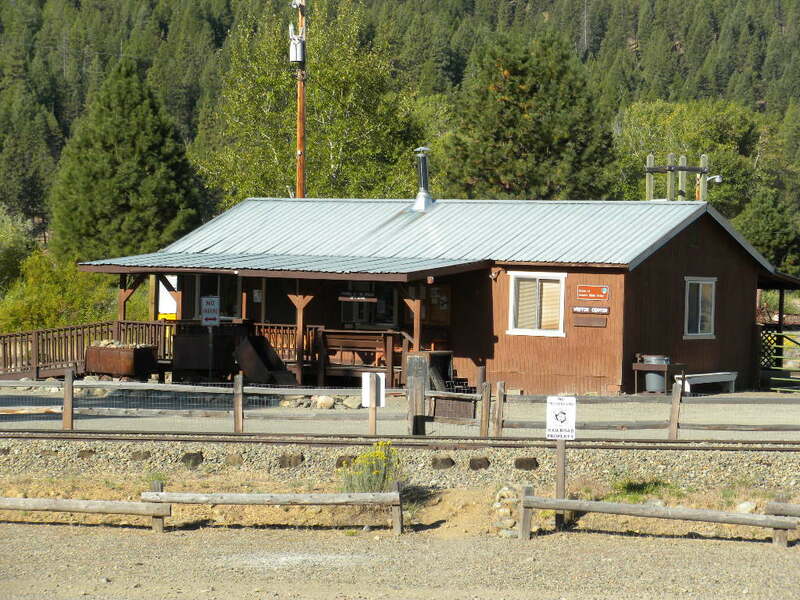 If you happen to be staying in town just walk right in or drive your ATV on the ATV trail to access the parking lot. While the dredge is closed the trails are still open and, at least for the time being, still boast some beautiful fall colors. 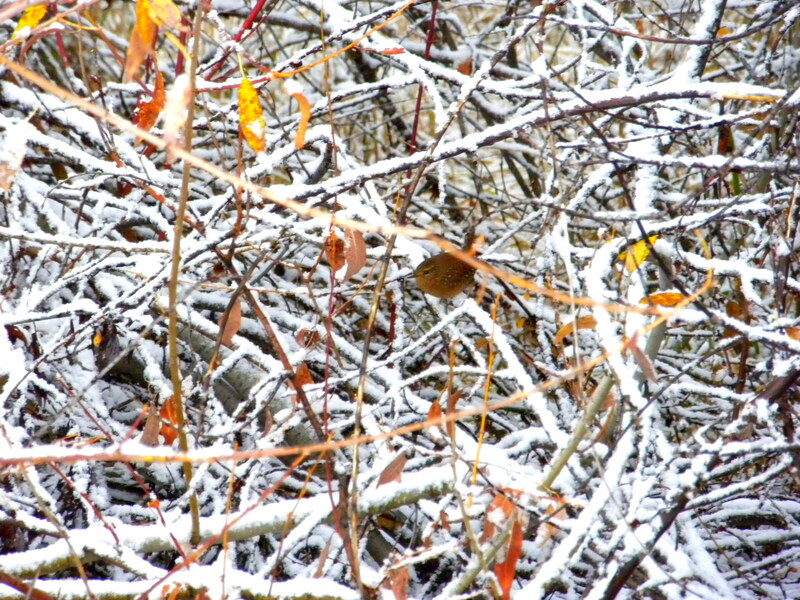 Now that most of the willows have dropped their leaves, this is also a great time to get some bird watching in. And when the snow comes? Bring your Snow Shoes! Or your skis…which ever comes first. Winter is a great time to come explore the park! 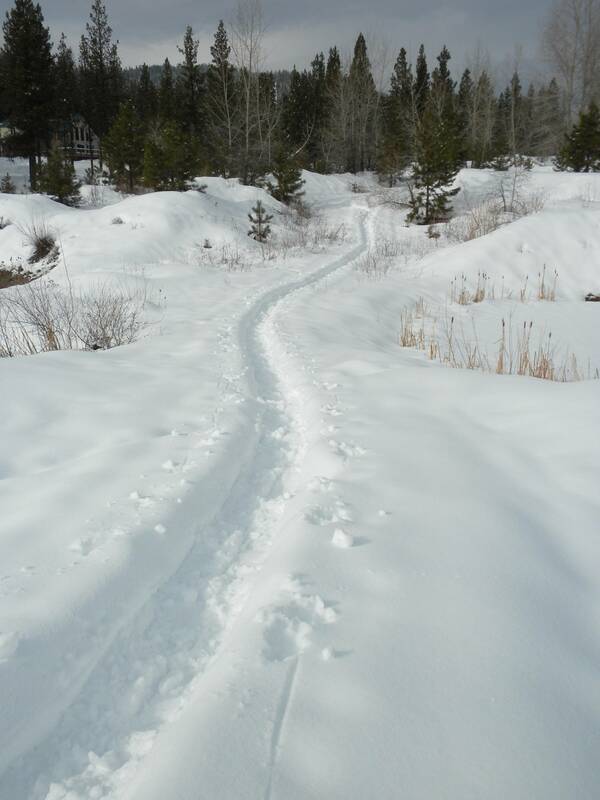 The snowmobile trail runs through the park allowing easy access to come down and check out the Dredge and park staff and locals come out to tamp down snow shoe trails throughout the park. So, next time you pull up to that gate, don’t turn around! 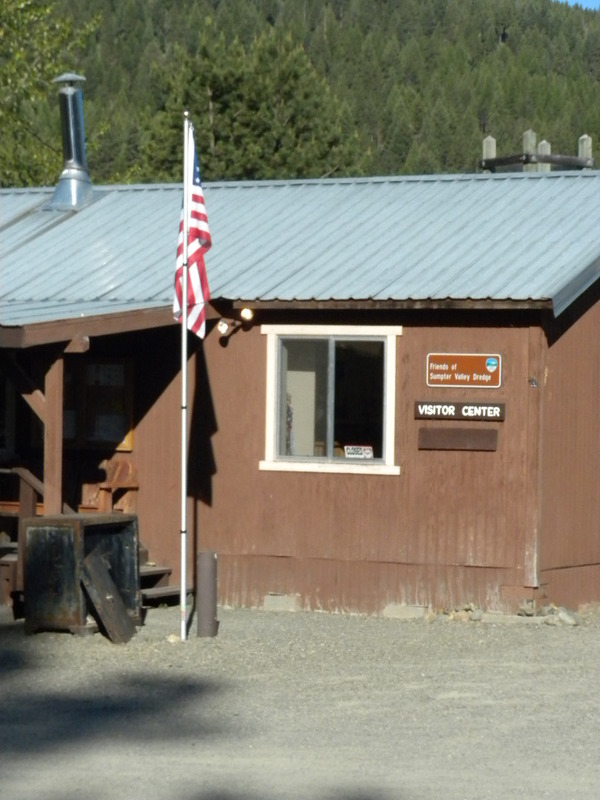 For more information about park access in the off season feel free to contact the park office at: 541-894-2486. 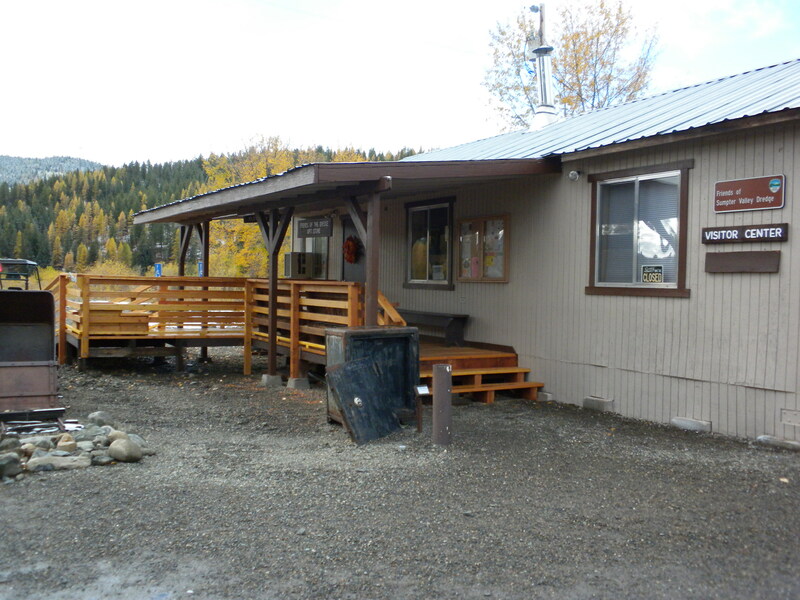 If you’ve cruised by the park in the last month, you might have noticed that the Friends of the Dredge Interpretive store has been undergoing a small transformation. The building, originally built to be a temporary store/museum until funding was available for an interpretive center, had been getting a little rough around the edges. It was time for a Face Lift. Ranger Assistant, Rella Browne, and Interpretive Naturalist, Sara Holloway, took on the task of getting the building taped up, painted, and Everyone pitched in to finish the trim work. 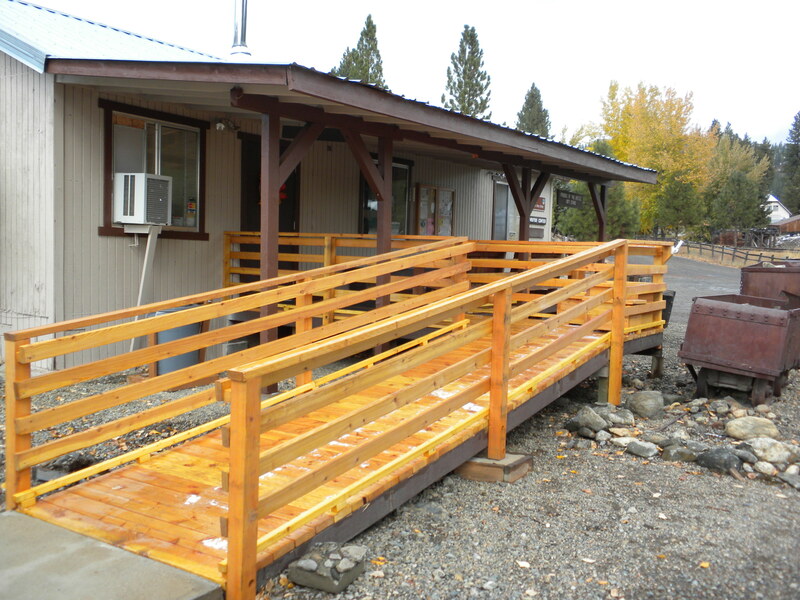 The paint job was followed by the installation of the new deck by park hosts, Skip and Karen Myers, and Park Ranger, Miranda Krane. Trying to figure out what to do with all of those loose ends from left-over projects? Make flower boxes! The store has been scrubbed, loved, and whipped into shape for next season! This time of year the signs that Summer is gone and Autumn is here are very apparent. The leaves are displaying their colors. It’s still dark when the dredge gets up. Park Staff can’t clean the bathroom in the morning because the cleaning spray freezes to the toilet. The beavers are busy damming the river. 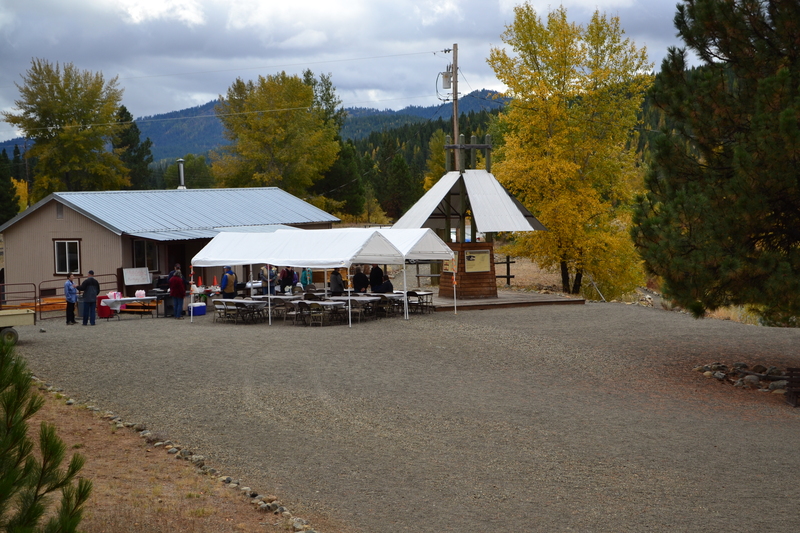 Perhaps the biggest sign that the seasons have changed is the Friends of Sumpter Valley Dredge hosting their annual LOTS party! LOTS stands for “Last of the Season”. For centuries communities and groups have come together in the autumn to celebrate the returns from the harvest and the successes from the summer growing season. The Friends of the Dredge do the same….Minus the actually harvesting. Whereas we begin the year with the Annual Meeting inviting all to come and find out what we have planned for the upcoming year; The LOTS Party is our way of celebrating and sharing with everyone the successes and achievements of as the year comes to an end. Setting up for the big day! Last Saturday the white tents went up behind the Interpretive Store in preparation for the gathering. 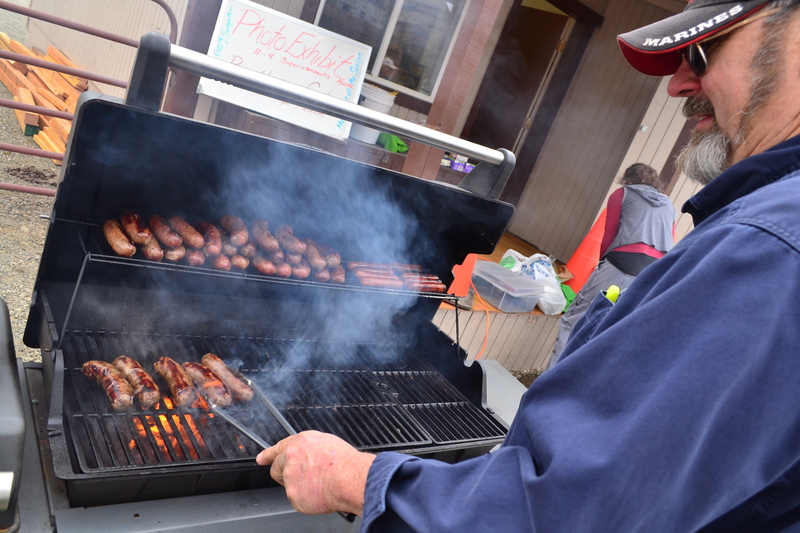 This year the main course was BBQ Brats cooked up by Sumpter’s very own Bratmeister and Mayor, John Young. 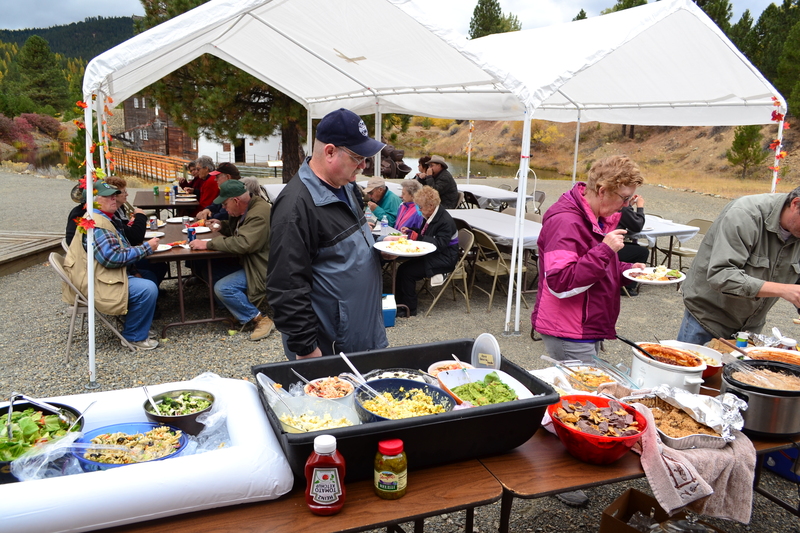 Potato salads, cheesy hot potato casseroles, sauerkraut salad, and pasta salad were just a few of the delicious side dishes where shared by some of our community’s best chefs. 99 Brats and several packages of hotdogs went through this grill! Despite the rainy weather we had quite the turn-out for the event. 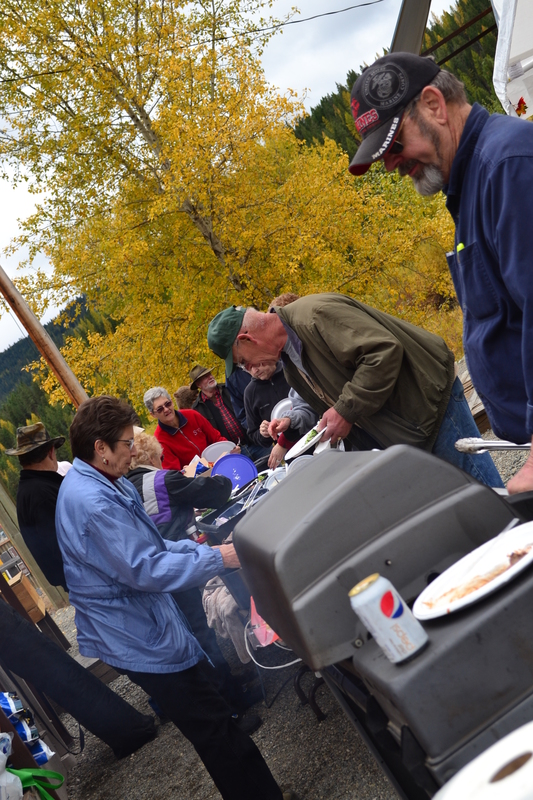 Including Friends Members, Park Staff, residents of Sumpter, park visitors, and participants and staff of the Sumpter Valley Railroad Fall Foliage Train, over 75 people joined us as we celebrated the successes of the season. The rain held off as we ate, enjoyed the colors of Fall or explored the dredge. We’d like to say thank you to everyone involved putting this event together, helping with setup, preparing food, and the tearing down. It was a great success! While walking through the Sumpter Valley, rock lovers, and non-rock lovers alike have the wonderful opportunity to see lots of beautiful rocks strewn across the landscape. In my experience you may not find something to be beautiful until you know more about it. This may apply to anything from people to rocks. This thought stimulated my desire to share information about the beautiful rocks we see in the valley. 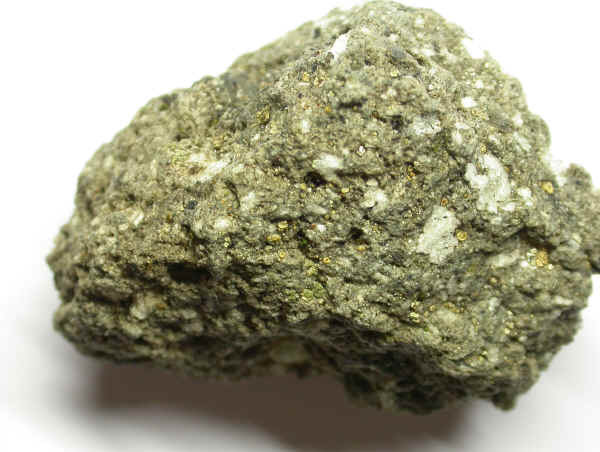 From previous blogs we now know about the rock called Andesite. We could call ourselves experts on the development of this rock, or we could simply find enjoyment by the fact that we now know how it was made. However you choose to use this information is your choice. I would like to continue our discussion about the geological history of the area by talking about the most economical impacting geological event in the area. Country Rock for the area is Andesite. When someone mentions country rock they do not mean rock that is from the south and has an accent with a drawl. Country rock is simply the rock that was there before any other rocks came into the area. An Intrusion is when liquid rock (magma) pushes its way into the country rock. You can think of it like an intruder. You would consider someone coming into your house without permission, or someone that does not belong there to be an intruder. The same concept can be applied to rocks. The intruder is a type of rock that pushes its way into the country rock or rock that was there before. Once the Andesite had made its self-nice and comfortable, an intruder came. This intruder was granite in its magma form. As granite intrudes into the country rock it starts partially melting and including the country rock in the magma body. The more minerals and chemicals the magma body includes the more enriched the magma becomes. When people think of magma most people don’t consider the water associated with it. There is actually a lot of water in any magma; some types of magma have more water than others. The water in magma is not something that we would consider to be water on the surface. This water is under such pressure, heat, and is full of so much material it cannot stay in a liquid state when it reaches the surface. It may be hard to imagine, but the only thing that is keeping the water that is in magma, in its liquid state is pressure. When a volcano erupts and all the pressure that was keeping the water in its liquid state is released, the water becomes stem instantly. As the granite intrudes into the country rock it breaks and cracks the country rock. The water from the magma then squirts into the cracks caused by the inclusion. As the water gets further and further away from the magma it starts to cool down. As the water cools it starts to drop some of the minerals it was carrying. One of the minerals the granitic magma body carries is quartz. Another material the granitic magma body of this area carried was gold. This is why we had veins of gold in the Sumpter Valley area. You may have heard that chemistry is just like cooking. The same comparison could be made about geology. There are many times that I will be cooking and get excited about how something is cooking because it is exactly how geology works. If you want to spice up your cooking experience I have two activities you should try next time you have the opportunity (for children, please ask your parents’ permission before trying this yourself). Pressurized water: The next time you have a pot of water boiling for pasta, cover it with a lid (hopefully a clear lid). 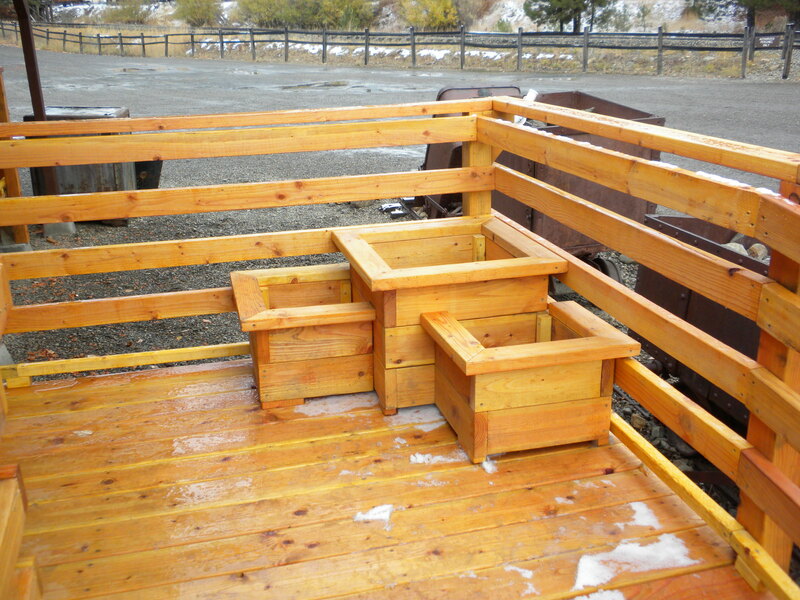 You will notice water build-up on the inside of the lid, but there will not be any steam between the lid and the water. Take the lid off and notice all the steam that escapes. You were not able to see this steam before because it was in a liquid state. The water stays in a liquid state until you release the pressure on the container allowing it to turn to vapor. Mineral drops: Take a pan of water and heat it just below boiling temperatures. Add salt, or sugar until you can’t add any more. Take the saturated water off the heat and allow it to cool. Once it has cooled to room temperature you may need to add just a pinch more of the salt, or sugar before you can notice a difference. Once the water has cooled you will notice all the salt or sugar that fell out of the water. You will not be able to mix any more of the salt or sugar into the water. This is because water can hold more material the hotter it is. Can anyone believe the summer is just about over? It seems just yesterday I was driving into Sumpter for the first time. The season has gone so quickly, but we still have a few weeks left. As my time in Sumpter grows to an end, I would like to leave the wonderful people of this park with a small gift. 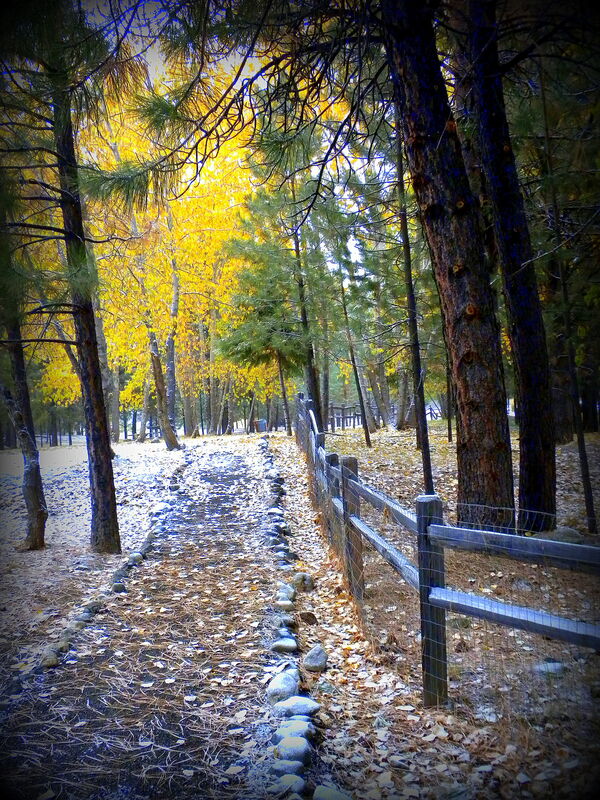 While living here in Sumpter I have been referred to as the Geologist. While I am not finished with school yet, or registered I do hope to become a true geologist in the future. As a parting gift I have decided to dedicate the last few blogs to the geology of the area. Plate Tectonics is the theory that the surface of the earth rides on the top of large plates. These plates move by going under one another, squishing up against each other, and spreading away from each other. When one plate goes under another, or subducts, it causes volcanos. The volcanos are formed because the one plate going under the other one melts and causes magma, or lava, to form. Depending on what the plate is melting into and how it melts creates different types of rock. Island Arcs are formed from subduction. Imagine two tectonic plates that are under the ocean meet together. The plates are going towards one another so one of them has to give up and subduct under the other one. When this happens, the magma comes up and forms a line of volcanos. To humans they may look like a line of random volcanos in the middle of the ocean, but they really form on the line where the two plates meet. The parent rock, or oldest rock, of the area is called Andesite. Andesite is created from one plate subducting under another one and forming an island arc. As the plate these islands are on continues to move it gets closer and closer to the continent. Finally when it reaches the continent the poor islands on top are between a rock and a hard place. These islands stick up too far to go under the continent so they get squished up on top of it. Once these islands become part of the continent they become what is called Exotic Terranes. The Andesite of the Sumpter Valley was created in this way. 400-100 million years ago the Andesite of the Sumpter Valley was getting squished up on the continent so we would be able to enjoy it today. If you get a chance to go hiking around Sumpter, pick up an Andesite rock and you will be able to hold a few hundred million years of history.